with natural circulation circulating pressure are measured In systems of water heating only by tens millimetres of a water column. So small pressure do not allow suit the given systems in the buildings having the big extent, besides, they application of pipes of considerable diameters that conducts to the big expense of metal demand. the Listed lacks are deprived system of water heating with artificial circulation . In them water circulation is created by centrifugal pumps. The pumps operating in closed rings of system of heating, filled with water, do not lift water, but only it move, creating circulation and consequently are called as circulating. the Circulating pump include, as a rule, in a return highway of system of heating for increase in service life of the details co-operating with hot water. On fig. 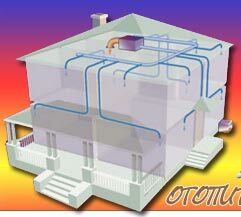 2Р°, 2Р± systems of water heating with artificial circulation are represented. A broad tank connect not to submitting, and to a return highway. In heating systems it is expedient to apply special circulating pumps , waters moving a significant amount and developing rather small pressure. These are quiet horizontal lopastnye the pumps of centrifugal type connected in the uniform block with electric motors and fixed directly on pipes (without the base), for example pumps of type TSNIPS (fig. 3) or TSVTS (fig. 4). Application of pump systems of heating allows to increase essentially extent of the pipeline and to reduce metal consumption of system of heating at the expense of reduction of diameters of planting pipelines. Besides, with installation of the circulating pump there is a possibility of application of new circuit decisions of system of heating, for example, refusal of the top distributing of pipelines. However application of pump systems of heating is possible only under condition of a reliable electrical supply. 1 - a copper; 2 - a submitting line; 3 - a return line; 4 - submitting struts; 5 - return struts; 6 - an air-line; 7 - an air collector; 8 - a broad tank; 9 - the pump; 10 - a broad pipe. 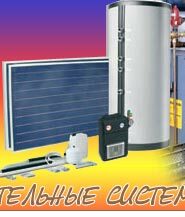 At absence teplogeneratorov on firm fuel with fire chambers of long burning can find application of system of water heating (fig. 5) with bakomakkumuljatorom and the circulating pump of type TSVTS. 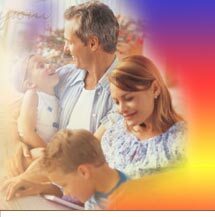 Such system allows to reduce considerably operational expenses on service of the generator of warmth. In a special tank which starts to work after the operation termination teplogeneratora. Volume bakaakkumuljatora select so that time of its discharge made not less than 8 hours (at work teplogeneratorov two times a day for 4 hours). For effective work of system bakakkumuljator should be carefully teploizolirovan for the purpose of an exception of useless losses of warmth. 1 case; 2 - a delivery branch pipe; 3 - a counterflange for pipe joining; 4 - the electric motor.